Task analysis (K. Landau et al.). Allocation of functions to humans and machines in a manufacturing environment (A. Mital et al.). Occupational and individual risk factors for shoulder-neck complaints (J. Winkel, R. Westgaard). Repetitive work of the upper extremity (Å. Kilbom). Human muscle strength definitions, measurement, and usage (A. Mital, S. Kumar). The reduction of slip and fall injuries (T.B. Leamon). Job design for the aged with regard to decline in their maximal aerobic capacity (J. Illmarinen). Design, selection and use of hand tools to alleviate trauma of the upper extremities (A. Mital, Å. Kilbom). Equipment design for maintenance (S. Imrhan). Designing warning signs and warning labels (M.R. Lehto). Vision at the workplace (S. Konz). Evaluation and control of industrial inspection (T.J. Gallewey). Evaluation and control of hot working environments (J.D. Ramsey et al.). Cold stress (I. Holmér). Noise in the office (A. Kjellberg, U. Landström). Work/rest (S. Konz). Managing stress in the workplace (A.M. Williamson). Economic evaluation or ergonomic solutions (E.R. Andersson). Author index. There is an urgent need to disseminate ergonomics "know-how" to the work place. This book meets that need by providing clear guidelines and problem solving recommendations to assist the practitioner in decisions that directly protect the health, safety and well-being of the worker. 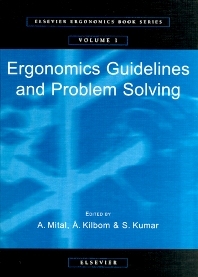 The guidelines have evolved from a series of symposia on Ergonomic Guidelines and Problem Solving. Initially experts in each area selected were asked to write draft guidelines. These guidelines were circulated to participants at the symposia and to other experts for review before being comprehensively revised. In some instances these guidelines cannot be considered complete but it is important now to put some recommendations forward as guidelines. It is hoped that as new research emerges each guideline will be updated. Each guideline has been divided into two parts. Part I contains the guidelines for the practitioner and Part II provides the scientific basis or the knowledge for the guide. Such separation of the applied and theoretical content was designed to facilitate rapid incorporation of the guide into practice. The target audience for this book is the practitioner. The practitioner may be a manager, production system designer, shop supervisor, occupational health and safety professional, union representative, labor inspector or production engineer. For each of the guidelines, relevant practitioners are described. Topics covered include work space design, tool design, work-rest schedules, illumination and maintenance.